This year I returned to Gran Canaria for the third time. The first trip was in 2015 when I had just moved to Europe and I was transitioning from running multi-stage races to ultra-marathons. I was full of confidence and very excited about the race. Unfortunately, I was also under-prepared and not ready for the conditions or distance. You can read my race report to see what I learned from that experience which ended up in a very unhappy DNF. Last year I went back with a plan to run a shorter distance and to run a much better race. I had a good day, ran a good time and enjoyed the race tremendously. It was hot, dry and tough, but I handled the conditions and executed my race plan exactly. 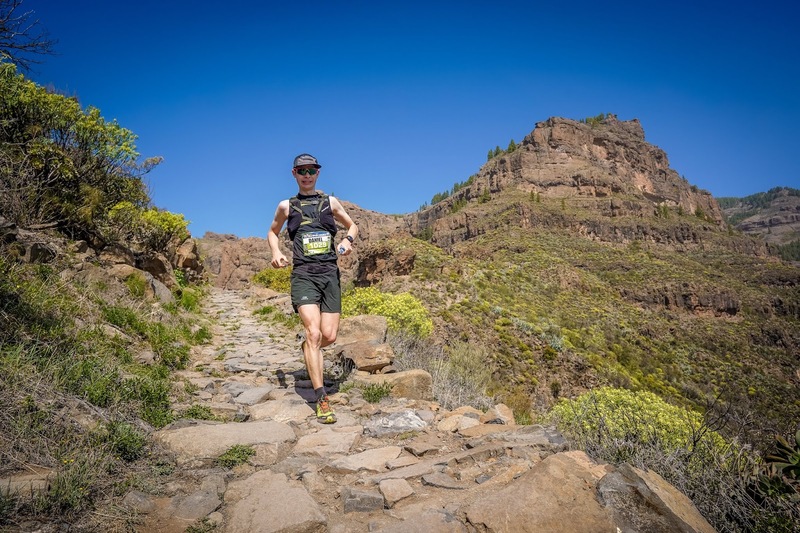 I was well prepared and after a podium place at a similar distance in UTCT I felt in good form and it showed on race day. This year I was extremely excited to race. I entered the Advanced race again and I knew the route and what to prepare for. Over the winter I spent a lot of time practicing for the descents, simulating the climbs early in the race, and getting into great shape. I felt like I was in the best shape I have ever been in. I couldn't wait to get started and I was confident that I would be faster than 2018. On the first climb of the race I was moving well and in a good position. I started off at a controlled effort, but fast enough to stay ahead of the traffic and steady enough to pass by the few people who over-extended themselves sprinting out of the start village. On the descent down to the first checkpoint I passed a couple of people, I felt light and fast and I was enjoying myself. At the first checkpoint I didn't even stop. V handed over my water and nutrition on the go and I shouted to have extra water at the next checkpoint because I was feeling hot and I wanted to be ready for a hot day. Everything was on track. On the second climb I was moving well again. I had my poles with me (I didn't bring them in 2018) and I settled into a good rhythm. I caught a couple more people and I knew I was in control. I ate and drank all my nutrition and stayed on plan. 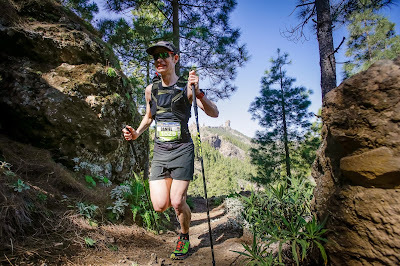 At the top of the climb there are some undulating trails leading into the checkpoint at Garañón and I was running these relatively easily. I had run out of water and I was feeling a little hot, but I knew I had extra water waiting for me at the next checkpoint. When I met with V I dropped off my poles (the race is mostly downhill from that point), drank the original soft flask of water I had planned to take with me, and took a larger soft flasks with more water for the next section. In the aid station I passed a couple more people and then out on the trail I caught someone who had just left before me. I could feel the heat and I made sure to drink my extra fluids starting quite soon after leaving the aid station. There was a long descent ahead and I planned to run it in the same way I had simulated in training. However, I couldn't get into a good rhythm. I felt low on energy and I was starting to get a headache. I was still running, but not how I had envisioned before the race. I wasn't too worried as it could have just been a low spot during the race. I decided to be smart and cautious. I ate an extra gel, took some extra salt and drank more frequently. I slowed a little to let my body absorb all that extra nutrition and water and tried to be calm and patient. During this section I passed two runners sitting on the side of the trail. I asked and they said were ok, but that they couldn't handle the heat. I thought I knew how they felt - my headache was getting worse - but I thought I was on top of it until I ran out of water. I started walking and running and just trying to get to the next checkpoint. The checkpoint at Hierbahuerto was a welcome relief. The runners weren't allowed crew there, but the race staff were really friendly and helpful. I sat down, drank a litre of water and Coca-cola, took some more salt, and sprayed myself with water. I cooled down a little, took two full soft-flasks of drinks with me and took a whole handful of orange slices to get a little extra fluid and sugar. Leaving the checkpoint I was jogging and feeling a little better. I ran at a gentle pace and then tried to pick up the pace again. I was drinking frequently and taking all my nutrition, but I just couldn't cool down. I had stopped sweating and my headache was getting worse. I started to walk on the downhills because the pounding was hurting my head. I kept drinking, but my body didn't seem to be responding and I couldn't get any relief from the heat. My skin was bone dry and I ran out of water quickly even though I had taken on double what I had planned before the race. I ended up walking and jogging to the next checkpoint - mostly walking. This should have been one of the fastest sections of the race, but I was hardly moving. In the checkpoint I sat down again and V did everything to help me to try and cool down. I drank loads of water, ate watermelon and oranges, put ice in my cap and sat in the shade. My throbbing headache just wouldn't go away and I felt like I couldn't drink enough. In the checkpoint I knew that I had been showing symptoms of heat stroke for the last few hours and I knew that the last section would be hot and exposed to the sun. With V's help, we assessed how I was doing and decided it wasn't a good idea to go on because of the risk. I abandoned at the last checkpoint of the race. After the race I spent the rest of the weekend trying to rehydrate and cool down. By Sunday afternoon I was feeling better again. Despite not finishing the race, I wasn't too disappointed. 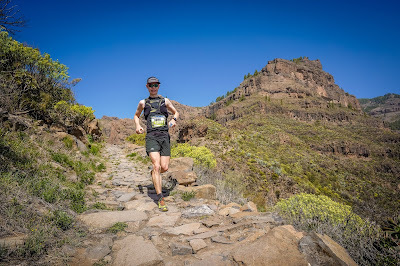 I did excellent training leading up to the race, I knew the route well, and I had done the best heat preparation I could have (without going to the island a few weeks in advance). I executed my race plan well, I listened to my body and I tried to adjust when I wasn't feeling good. I made a good decision to look after myself and fight another day. Unfortunately I wasn't ready for the race day conditions. The forecast had been 23C and it was over 32C when I stopped. I know I could have handled the forecast temperature (because I did in 2018), but that's not what happened on the day. This time the heat was a variable that I wasn't prepared for and it ended my race. In the future I need to be ready for something like that or choose my races careful to avoid extreme difference between my training conditions and the race conditions.